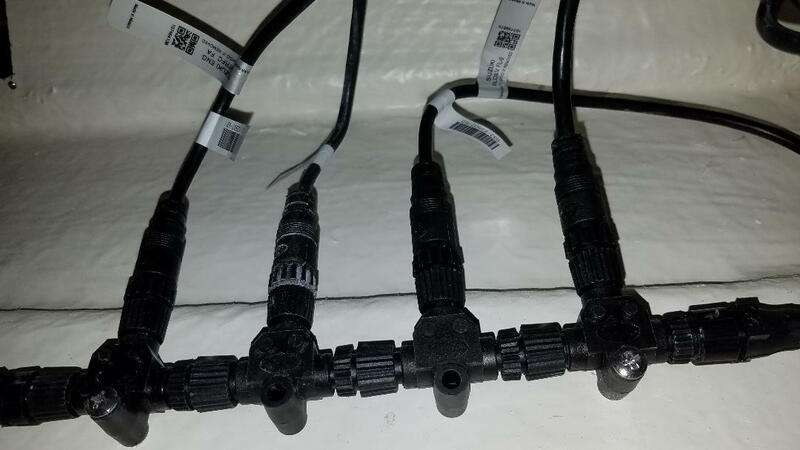 Please explain these Suzuki Connections? Presumably, 1 is the fuel sender, 1 is power, 1 presumably goes to the C10, what's the other?? Thanks. Nothing on the network but the C10 and the Fuel sender. Last edited by Schmaltz~Herring; 03-12-2019 at 02:47 PM. Presumably you meant to attach a pic to that post. Agree. Rotate picture... cable on far left, looks like tag says, "engine interface", (abbreviated). Thing is... why would you need a fuel flow sensor? Engine info already gives, (calculates) that. The connection second from left looks a bit crusty - what’s with that? If it is salty residue it needs to be cleaned off. Looks like gelcoat residue/powder, from cutting/installing. my Suzuki 300 has 3 network connections including the C10. Keep in mind they need to be power isolate with the yellow T.
Can I remove one of the end pieces and install a T with the end piece [resistor] and just connect a drop to the Garmin for engine data on the Garmin? this, boat only used 4 times on lake. Do you have anything else other than the Garmin on the network? No, the Garmin 942XS is standalone, only the transducer connected. Why? Please explain the benefits for the OP’s network?? Yes, exactly. Actually you can insert the new T piece between any 2 existing T’s to achieve the same result. Adding the Garmin will also allow GPS data (such as speed) to be shared with the network, and the C-10 will then show you live mpg, distance to empty etc. When any new device is added to the network, its always a good idea to reset network data sources. This ensures all devices adjust their data sources to the logical settings given new data is available. Turn all network devices on including the Garmin. On the C-10, open the menu, system/network and select the option to auto-select data sources. Select yes when it pops up message asking if you really want to. Done.